Warren Breninger is a visual artist and a poet. He has been exhibiting since 1971 and his poetry has been published in various journals since 1977. His art work covers mixed media, painting, photography and drawing. you hold on waiting to be consumed. While the innermost organs settle like sunken ships. Born in Melbourne in 1948, Breninger lives in North Frankston, Victoria. He is married with five children. He completed a Master of Fine Arts at the Victorian College of the Arts, 2000-2001, and is a part-time secondary teacher of Media and a casual lecturer in drawing. He has had 28 solo exhibitions since 1974 and his work is in most state collections including the Australian National Gallery. He has won various prizes including the James Farrell Self Portrait Award in 2001, the Blake Prize in 1989, the Alice Prize in 1989, the Dominique Segan Drawing Award in 1988 and the Lady Fairfax Portrait Award at the Art Gallery of NSW in 1982. 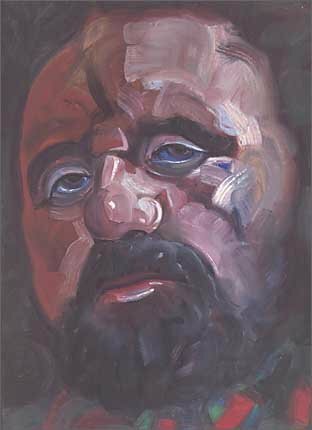 He was a finalist in the 1998 Archibald Prize with another self portrait.